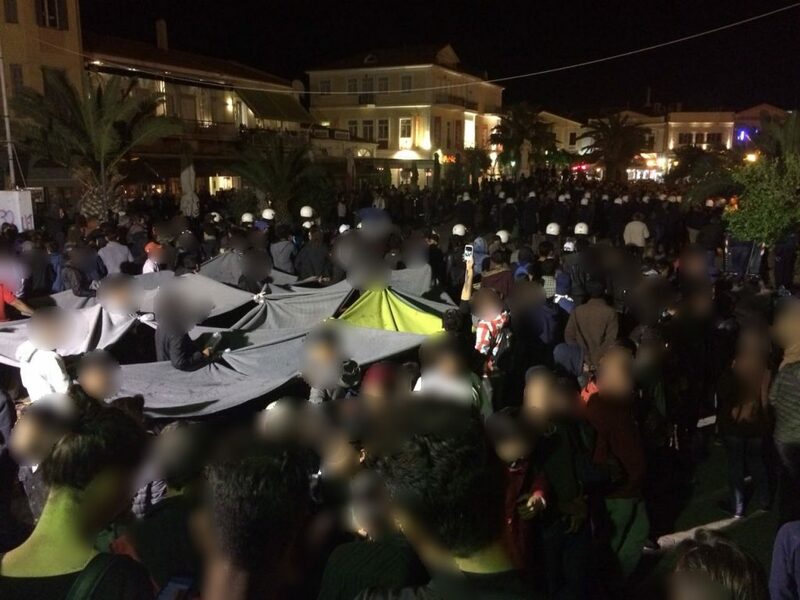 On the night of April 22nd, a group of 200-300 fascists attacked a group of residents of Moria camp on the Greek island of Lesbos. 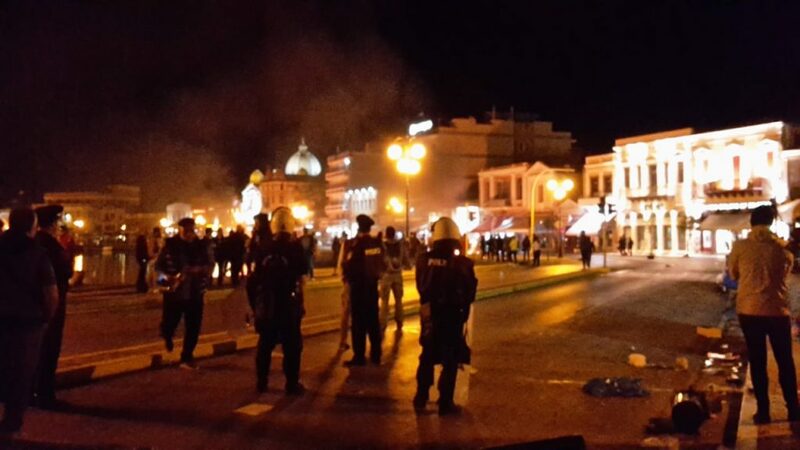 The pogrom lasted all night, leaving dozens of those occupying the square injured. Ultimately police evacuated the square entirely. At the beginning of last week a group of Moria’s residents moved out of the crowded state camp in the olive groves of Moria to Sappho Square, Mytilini’s main square. The group settled down there, occupying a part of the square day and night. There are many reasons for their protest, including the oversight and inadequacy of local organisations in providing medical care for a friend of theirs dying in hospital. And they protest more generally against the oppressive camp structures propped up by a number of NGOs. The protesters accused Eurorelief and MMS in particular, both of whom work in the prison-like structures of the camp. 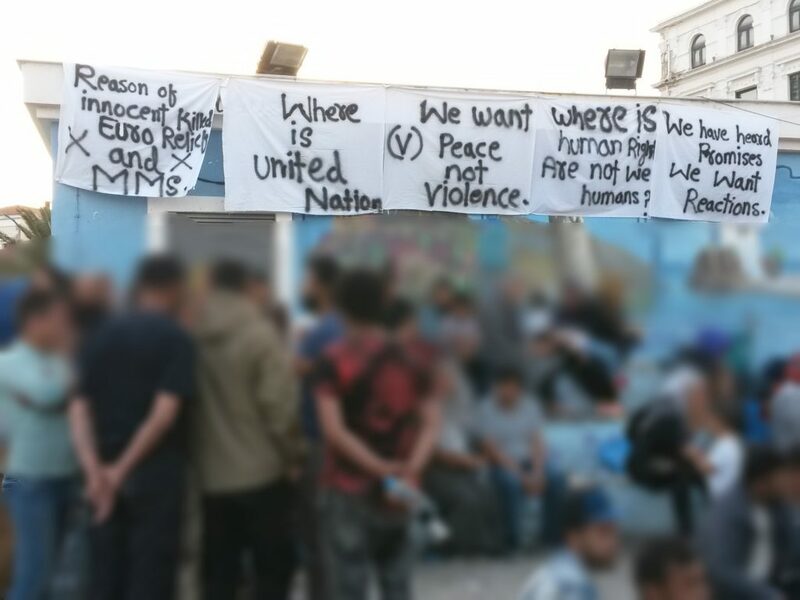 There were slogans against the UN, as well as fundamental demands for freedom of movement. Change of scene: Every Sunday a military parade and flag ceremony takes place in Mytilini. The Greek flag on the town hall is raised by the military and nationalists. This Sunday fascists came from all over Greece. After the ceremony they make their way to Sappho Square. The police are already present at this time and form a line between the people on the square and the surrounding fascists. Around 9 p.m. the first attacks occur: from the ranks of the fascists, two torches and a barrage of stones are hurled at the protestors. The protestors stand their ground, having already started to prepare for the attacks during the parade. They form a circle, with women, children and the elderly protected in the middle. All the others, including a few dozen Greek and international supporters, are standing around the edges. People start to form a tent of blankets to protect themselves from the objects to throw. Until just before 11 p.m. there is some peace and quiet. The group of fascists seems to calm down and decrease in size, and the police make negotiations with both groups. The occupiers want to stay, and the fascists make it clear that they want to drive them out. Reports from Moria camp, about an hour’s walk away, suggest that many people set out to provide support, but were stopped by police and driven back to camp. The camp was then locked down. Shortly thereafter there are new waves of attacks: Again, objects fly towards the people in the square. 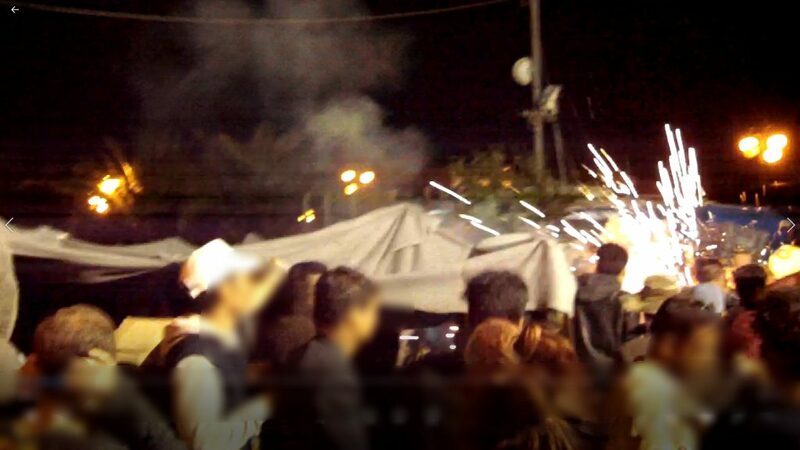 This time also firecrackers, and bins set alight, to break through the police rows. The attacks are shifting to the promenade. Occasionally there are small fights when fascists succeed in breaking through next to the police line. Throughout the night there are many injuries, mainly from stones, bottles and firecrackers. Many unconscious people are carried away after being hit in the head by rocks. There are open wounds as well as eye and ear injuries. In nearby premises, people of solidarity are setting up an infirmary in which injuries are treated in a makeshift manner. Due to the riots, it takes a long time for the first ambulances to arrive. Thanks to the strong solidarity structures on the island, fortunately some doctors are quickly on the spot. 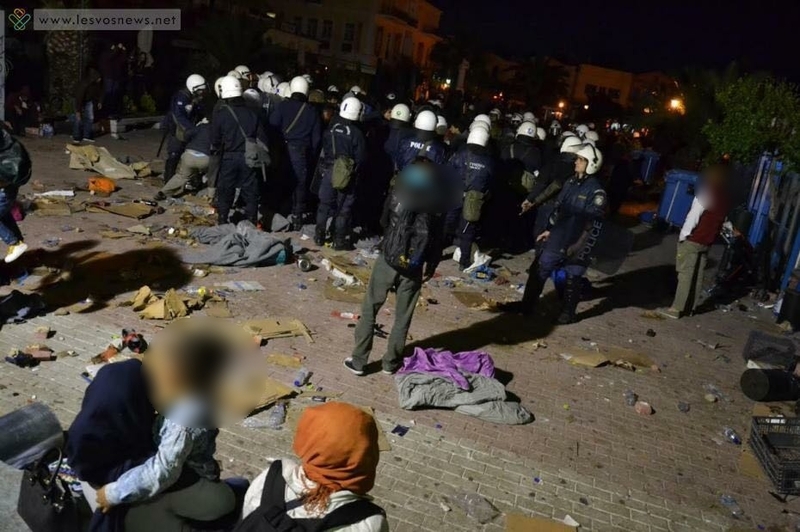 Small groups of fascists sometimes make it very close to the temporary infirmary, so that the injured have to be evacuated from there in an emergency and distributed to other places. still on the square. Although many have been injured and would like to retaliate, the people in the square are not provoked, and take great care that nothing is thrown back. In view of the great danger and the hopeless situation, the people on the square remain admirably calm. Stoically they accept the attacks and try to sit out the night. Don’t go back to Moria! But where else? fall down between the ceilings, which offer good protection against the stones, and explode between people. Tear gas wafts repeatedly pass by and get stuck under the ceilings. Individual groups of fascists try to get closer to the protesting people from all sides. Stones are thrown from the side at head level. There are constant attacks in which several dozens of projectiles fly over the bus at the same time. Among them massive stones, Molotov cocktails and big firecrackers. The fascists accept the dead. The police maintain a spatial separation of the two groups for most of the night. But often there is only a row of policemen in between. The people in the square remain within throwing distance. At times the police use tear gas, pepper spray and truncheons to drive back the fascists. This gives some space for a short time, but no sustained attempt is made to keep the fascists at a distance. For a long time there have been far too few police officers present. Many are probably still busy stopping the people from Moria who have run off in support. Only at the end, with the evacuation of the square, do new buses with policemen arrive. This night revealed the racist face of the Greek police. At 4 o’clock the police drive the fascists far away again and keep them at a distance. At the same time, they begin to crowd people together on the square. Supporters are attacked with pepper spray. The remaining 130 people are closely surrounded by the police. When it becomes clear that they will not voluntarily board the buses provided, the police use pepper spray and physical violence. This leads to last bad scenes. The police beat the people, kick them, and drag them by their hair across the square. After more than 8 hours of attacks by the fascists, the people are arrested and taken to prison by bus. It is still unclear whether and which charges will be brought. In addition, four Greek activists are also being taken away by the police. Most of the fascists, many of whom were not disguised, remain at large.